Humminbird has many of the products that got discontinued or you can say went dead and they are now resting in peace. Yet, some of their models that are still there and they are outshining the world than the sun. And 197c di is one of them. 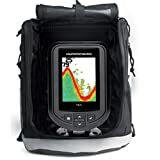 So you can actually guess that the write will be all about Humminbird piranhamax 197c di review. However, Humminbird is still popular among many of the fishermen, and if you are a fan of the brand then this write will be a great help to know about its model. 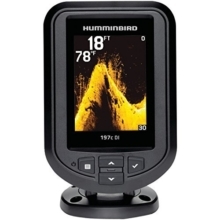 As their 197c di is still ruling the fish-finding world, we have thought to deconstruct the product with Humminbird piranhamax 197c di review. The reason behind the existence of sonar technology is it helps to determine the depth automatically. It adjusts itself so that it can keep the fish and the bottom visible on display. Moreover, the sonar technology tends to send sound waves from its transducer out to the water. And with the sonar returns, it will show a segment of time with objects that have been detected when the boat moves. So you will definitely get updated with the help of this technology. However, the DualBeam sonar in Humminbird piranhamax 197c di uses about 200/455 kHz frequencies. The wider beam forms 28 degree cone angle at 200 kHz frequency while the narrower beam forms a 16 degree cone at 455 kHz frequency. As you move along in your boat, the finder exhibits the changes in depth and will create a bottom contour profile. The device has Sonar View with which you can track down different intensity for returns via color range. The red one shows a strong return, while the yellow shows a medium strong return and as for the blue one, it shows a weak return. Additionally, with the Beam select option, you can set the type of sonar readings. The finder is able to interpret sonar returns for you once you understand the wonders of Fish ID+. Using this function will help you view a fish icon once you set it up and detect the fish around your trap area. Not only that, it also helps in assigning the icons to incoming information from the transducer. So, it becomes easy for the people, especially the beginners, to read the detail. But there is a little con that you should know regarding the function. So this Fish ID+ might sometimes end up misinterpreting debris with a fish and will show notify you with the fish icon. So, this might make you a little mad as it does not give you a good result. The Humminbird piranhamax 197c di comes with a Fish Alarm that makes a sound when sonar senses a fish around that matches up to a specific size. Moreover, you will also find a depth alarm that functions only when the depth is lower than the selected value. Additionally, the finder has a Battery alarm as well that rings when the battery is equal or lower than the setting. The transducer on Humminbird piranhamax 197c di features a built-in sensor that allows you to measure and track water temperatures. You can call it one of the most important features of owing a finder. It’s because different species of fishes have different preferences when it comes to the temperature. For instance, species like largemouth bass live well in a temperature range from 68 to 78 F whereas lake trout thrive in waters between 48 and 52 F. Thus, you actually need a tool so you can measure temperature to understand the world of water. 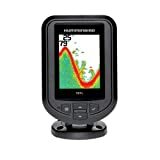 This sonar fishfinder comes with a 3.5-inch color TFT screen. The display consists of a resolution of 240H x 320V. In short, the finder has a small screen that does not put out a high-quality image honestly. So, it might disappoint you in this case. However, you will find an LED backlight so it can help you read the display under any lighting condition. The finder has a backlit display, so you can read it during the day or even at night. The alarms help you with the notification regarding the fish and the bottom. The Fish ID+ lets you know about the presence of fish around your web. It features built-in sensor to measure water temperature. It has depth capabilities of 320 ft. The screen is way too small. Many of the items are not included. You might have depth problems. The Fish ID+ might misinterpret other bits and pieces as fish and notify you with the fish icon. There are navigational features and very few options for upgrade. Q: Does unit provide water temp and boat speed? A: It definitely provides water temperature sensor, but you will not get boat speed feature. Q: Does it come with transducer? A: Yes, it comes with the transducer. Q: Can you use this for ice fishing? A: Yes, you can use this for ice fishing as long as you get the transducer in the water. Q: Is screen backlit for night-time fishing? A: Yes, the screen is backlit for night time fishing. Q: Can I change the unit from feet to a meter? A: Yes, you can change the measurement unit from feet to meters, as well as the temperature from Fahrenheit to Celsius. Q: Can you mount this on a pontoon boat? A: Yes, you can mount it on a pontoon boat. Overall, the device is a great help in finding the fish and it does its job really well. Although the small screen size and the befuddled Fish ID+ function might upset you sometimes, but if you go for the performance of the finder, you will find it amazing. And we hope that with Humminbird piranhamax 197c di review, you will be able to decide that whether you wanna go for it or not.